Rubber Bridge Players/New to Duplicate – Welcome! 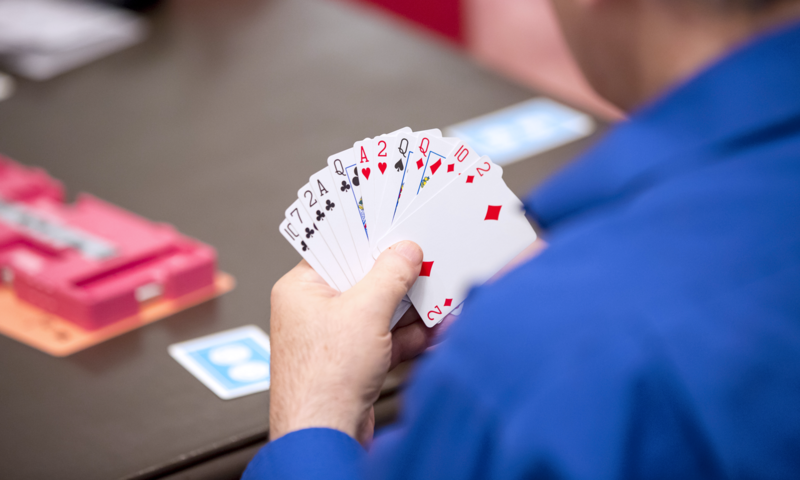 Are you--and perhaps your regular partner--curious about duplicate bridge? You’ve come to the right place! Find the answers to your questions below and come play in our Limited masterpoint games on Tuesdays and Wednesdays at 1 PM. (See Games/Calendars). They’re the best place to start. Just come about 20 minutes early and someone will fill you in on the few differences in how duplicate is played. 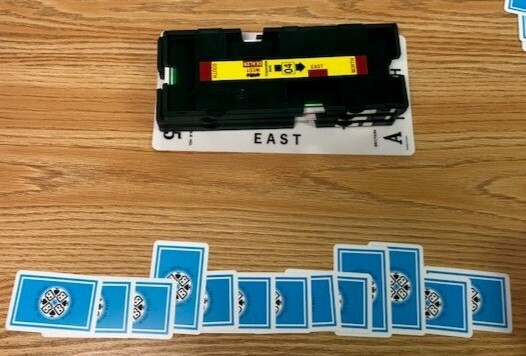 Duplicate bridge is the same bridge you’ve always played, but more fun! Why is it more fun? Because you and your partner will play the same hands as all the other East-West or North-South pairs. At the end, you can see how you did overall AND on each hand compared with all the other pairs playing the same direction. Plus, you can view the actual hands with printed hand records after the game or online here. How does the play proceed? You and your partner (if East-West) will play two to four hands against one North-South pair, then move to the next table to play new hands against a new North-South pair, and so on. The North player will enter the results for each hand and you or your partner will be asked to verify them. When you sit down at each table, you’ll find new duplicate boards with cards in a separate slot for each player. On the board for each hand, dealer will be indicated and of course, this player has the first chance to bid. The boards also show which pair(s) are vulnerable on each hand. Take out, count and sort your cards. When it’s your turn, remove the bid, pass or double/redouble card you want out of your bidding box (see below) and set it in front of you faced so other players can see it—someone at the table will show you how. 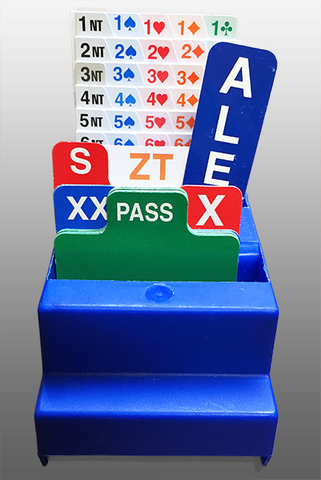 After the final bid is reached, the bid cards are replaced in the bidding box, the player to the left of the declarer leads and the dummy is tabled. The declarer tells his partner which card to play instead of pulling cards from the dummy himself. As you play to each trick, place your card face up on the table. When the trick is complete turn it over, pointing toward your partner if your side wins the trick, toward the opponents if you lose the trick. After each hand, check the result as recorded by the North player, then place your cards back in “your” slot in the board and proceed to the next hand. At the end of the round, these boards will be sent to the next table, where they’ll be played again. It’s that simple. How are the hands scored? Each hand is played and scored separately. Scores per trick made are the same as in rubber bridge and there are similar bonuses for bidding and making a game or slam. However, overtricks are even more important because your score on each hand is compared to that of all other pairs who played the same hand. Example: you may bid and make four spades (scoring 420 or 620 points depending on vulnerability) but if most other pairs bid game and made an overtrick (scoring 450 or 650), you won’t do so well on that hand. This is a friendly club! As you begin to play duplicate, everyone will be happy to help you learn anything you need or want to know. Or, to learn more now, click here. The Tuesday (Jim Kart) or Wednesday (Gary Chaney) directors are also glad to help with questions—their contact info is on the right side of the Games/Calendars page. Finally, you may want to visit our Learn page to find out about the many learning opportunities offered by this club. We look forward to seeing you soon at a FWDBC game! 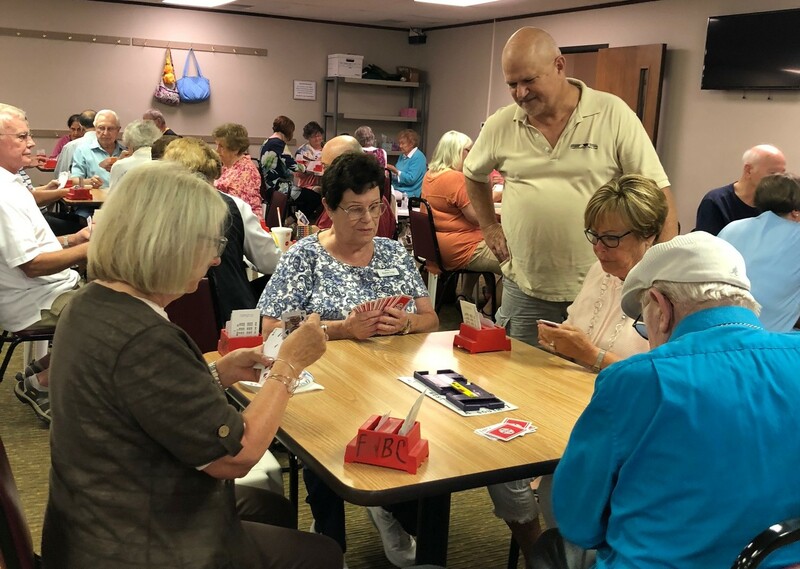 © 2018, Fort Wayne Duplicate Bridge Club. All Rights Reserved.